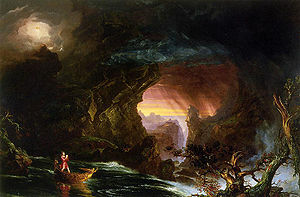 The Voyage Of Life, Manhood by Thomas Cole, 1842. Landscape is used as a term in painting for a representation of a natural scenery of land or sea, usually extensive, actual or fancied. Landscapes have been painted since ancient times. The Greeks and Romans created wall paintings of landscapes. Asian painting has a remarkable landscape tradition; it has been called "China's greatest contribution to the world's art". On a Mountain Path in Spring by Ma Yuan, 1180. Rubens, Landscape with the Château Steen, 1636. Joachim Patinir, a Flemish Northern Renaissance painter is considered the first Western artist known to have specialized in landscape painting; a pioneer in this genre, however his landscapes are not a separate subject but supported by religious themes. Dutch art saw landscapes as the medium that expressed pride in their country in the 17th century. Peter Paul Rubens, the most eminent representative of Flemish art, among a vast number of artists excelled in landscape as well as in portraiture, religious, mythological and allegorical subjects. Gillis van Coninxloo worked in a Mannerist style. Pieter van Laar developed his own style of landscape. Esaias van de Velde, Hercules Seghers, Jan van Goyen and Salomon van Ruysdael also were among the pioneers. Aelbert Cuyp was one of the most famous Dutch landscape painters of the Dutch Golden Age. Jacob van Ruisdael (or Ruysdael) was the greatest of all Dutch landscape painters; Van Ruisdael excelled in the painting of cloudscapes. Jacob Isaaksz van Ruisdael, Stormy Sea with Sailing Vessels, 1668. Jacob van Ruisdael, The windmill at Wijk bij Duurstede, ca. 1670. Landscapes had initially been mostly backgrounds. Pieter Bruegel the Elder, Landscape with the Fall of Icarus, ca. 1558. Jan Brueghel the Elder, River Landscape with Wood Cutters, 1608. Jongkind, Beach of Sainte-Adresse, watercolor, 1863. Nicolas Poussin, Landscape with a Calm, 1650 - 1651. Claude Lorrain, Capriccio with Ruins of the Roman Forum, ca. 1634. Maximilien Luce, Paris Seen from Montmartre, 1887. Valley of the Loue by Gustave Courbet, 1835-1836. William Turner, Norham Castle on the River Tweed, 1823. Château d’Ornans by Gustave Courbet, 1855. Cliff Walk at Pourville, 1882. Some considered the landscape painting as obsolete but it still has strength and vigor as may be seen in the following paintings. Earliest painters used landscapes only as background of portraits. Famous American landscape painters are: Asher Durand, George Catlin, Thomas Cole, John Mix Stanley, William Bradford, Frederic Edwin Church, Albert Bierstadt, Winslow Homer, George Caleb Bingham, John James Audubon, Thomas Moran, William Merritt Chase, John Henry Twachtman, and Ian Hornak. Thomas Cole, View from Mount Holyoke, 1836. Niagara Falls from the American Side by Frederic Edwin Church, 1867. William Morris Hunt, Dinan, Brittany, 1866. An Arizona Sunset Near the Grand Canyon, by Thomas Moran, 1898. The Gulf Stream by Winslow Homer, 1899. Works of John Constable and Richard Parkes Bonington influenced American landscape painting. Constable also influenced the Barbizon School and the French Romantic movement. John Henry Twachtman, The White Bridge, after 1895. The Joy of Winter by Clyde Aspevig. Li Kan, Bamboo and Rocks, ca. 1320. Vincent van Gogh, View of Arles with Irises in the Foreground, 1888. Albert Bierstadt, Looking Down Yosemite-Valley, 1865. Joachim Patinir, St Jerome in the Desert, ca. 1520. José María Velasco, El Valle de México, 1877. Asher Brown Durand, Kindred Spirits, 1849. The Transformation of Landscape Painting in France. French Art - The Peasant Painters. 5 Most Famous Landscape Paintings. Brief History of the Landscape Genre. Classical Landscape with Figures and Sculpture, Pierre-Henri de Valenciennes, 1778. A Capriccio of Rome with the Finish of a Marathon, Pierre-Henri de Valenciennes, 1788. This page was last modified on 11 July 2016, at 19:46.